When do we become aware of race and equity? Arianne E. Eason (PhD, Psychology, 2018) says it happens before middle school or even grade school. In her research, she has seen that even preschoolers view racial preferences as normal and young toddlers think about equity. Rather than alarming her, these findings give her hope. Eason has long been interested in race and equity. She developed an interest in psychology more recently, by chance. As a pre-med student at Yale, she needed a job to complete her financial aid package and learned of an opening in the developmental psychology laboratory of Kristina Olson, who studies how children think about social categories. By her junior year, Eason was conducting independent research in Olson’s lab. She decided to pursue a PhD in psychology rather than an MD, and chose the University of Washington for graduate school. “In my field, I sit across both developmental and social psychology, and the UW was very open to me being able to do both,” Eason says. “It ended up being the best place to do the work that I’m doing.” Olson joined the UW faculty soon after, and remains one of Eason’s mentors. At the UW, Eason has focused on factors that influence our attitudes about race. Her research has looked at how racially segregated environments, such as predominantly single-race neighborhoods or classrooms, influence not only an individual’s views about interacting with other races, but also their perceptions of whether other races are open to interacting in return. In my field, I sit across both developmental and social psychology, and the UW was very open to me being able to do both. Four faculty advisers — psychology professors Jessica Sommerville, Stephanie Fryberg (also in American Indian Studies), Cheryl Kaiser, and Olson — have helped guide Eason through her graduate studies. Eason fondly dubs them her “council of elders” and says they have helped her become a more effective researcher and a better person. That mentorship has led Eason in unexpected directions. Intrigued by Sommerville’s Early Childhood Cognition Lab, Eason developed a project there to look at young children’s awareness of equity. Studying 15-month-olds’ perceptions of people based on their resources, she learned that even the youngest toddlers think people with more are better than people with less. Eason wrote a paper about this research, one of at least seven that she is currently working on co-authoring. She has already published five papers. She credits support from a GO-MAP Presidential Award, a National Science Foundation Research Fellowship, and a Ford Foundation Pre-Doctoral Fellowship as providing her with the freedom to focus on this research program. 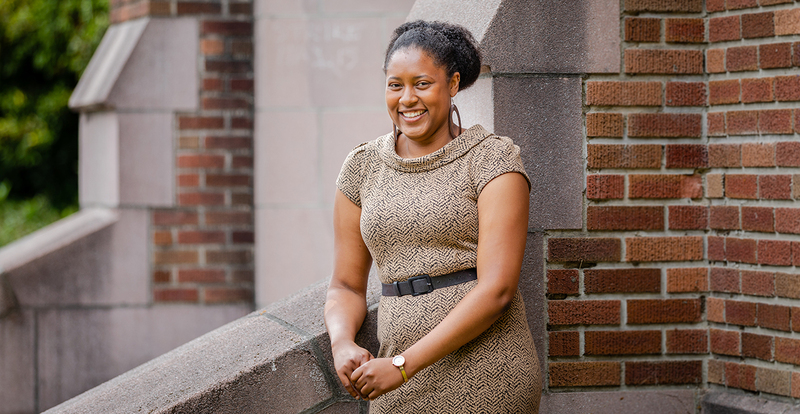 This fall Eason will continue to ask difficult questions about race and equity as a postdoc at Washington University, before joining the University of California-Berkeley faculty as an assistant professor of psychology in 2019. One thing is certain: though Eason is leaving the UW, her council of elders will remain a guiding force.